Engine Timing Belt Kit with Water Pump-Water Pump Kit w/Seals DAYCO WP295K1ES. Country of Origin (Primary) : CN. Harmonized Tariff Code (Schedule B) : 8413309000. Interchange Part Number : TCKWP295D, PP295LK3, 24527K. Life Cycle Status Code : 2. Product Description - Long - 80 : WATER PUMP KIT WITH SEALS, DAYCO. Product Description - Short - 20 : WATER PUMP KIT. See Item Specifics section for additional specifications about this part. To confirm that this part fits your vehicle, enter your vehicle's Year, Make, Model, Trim and Engine in the Compatibility Table. Also review the notes section in the compatibility chart for additional specifications about this part. This part generally fits Chrysler, Dodge, Volkswagen vehicles and includes models such as 300, Avenger, Challenger, Charger, Grand Caravan, Journey, Magnum, Nitro, Pacifica, Routan, Sebring, Town & Country with the trims of Base Sport Utility 4-Door, Crew Sport Utility 4-Door, Detonator Sport Utility 4-Door, Execline Mini Passenger Van 4-Door, Heat Sport Utility 4-Door, Highline Mini Passenger Van 4-Door, Limited Convertible 2-Door, Limited Mini Passenger Van 4-Door, Limited Sedan 4-Door, Limited Sport Utility 4-Door, LX Mini Passenger Van 4-Door, LX Sport Utility 4-Door, R/T Sedan 4-Door, R/T Sport Utility 4-Door, S Sedan 4-Door, SE Coupe 2-Door, SE Sedan 4-Door, SE Wagon 4-Door, SEL Mini Passenger Van 4-Door, SEL Premium Mini Passenger Van 4-Door, Shock Sport Utility 4-Door, Signature Series Sedan 4-Door, SXT Coupe 2-Door, SXT Mini Passenger Van 4-Door, SXT Sedan 4-Door, SXT Special Edition Wagon 4-Door, SXT Sport Utility 4-Door, SXT Wagon 4-Door, Touring Equipada Sport Utility 4-Door, Touring Mini Passenger Van 4-Door, Touring Premium Mini Passenger Van 4-Door, Touring Sedan 4-Door, Touring Sport Utility 4-Door, Value Package Mini Passenger Van 4-Door. The engine types may include 3.5L 3497CC 215Cu. V6 GAS SOHC Naturally Aspirated, 4.0L 3952CC 241Cu. V6 GAS SOHC Naturally Aspirated. This part fits vehicles made in the following years 2005, 2006, 2007, 2008, 2009, 2010, 2011. This item may interchange to the following part numbers from other brands. Brands: CONTITECH, CRP/CONTITECH (INCHES), CRP/CONTITECH (METRIC-FULL), CRP/CONTITECH (METRIC-IMPORT), GATES, GATES CANADA, MURRAY TEMPERATURE CONTROL Part Numbers: 24527K, PP295LK3, TCKWP295D. We at PartsMonkey are proud Canadians and are proud to serve our fellow Canadians. We offer a full range of automotive products from chassis components to auto body parts and everything in between. We carry the premium brands of the automotive aftermarket industry including Federal Mogal, Spectra Premium, Standard, Monroe, Bosch and Magnaflow. We also offer a wide arrangement of value brands at exceptional value. PartsMonkey is committed to the environment as well. Our goal is to provide you with any and all automotive products that may be required. Our exceptional relationship with our suppliers allows us to source any parts you may require within a small time window. If the product is defective then we will do our best effort to have a replacement part sent out in a timely manner or issue a credit for the product. Portions of the part information on this page have been provided by WHI Solutions, Inc. 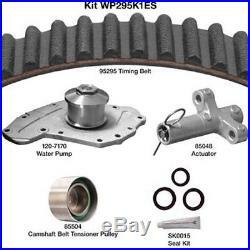 The item "Engine Timing Belt Kit with Water Pump-Water Pump Kit withSeals DAYCO WP295K1ES" is in sale since Friday, April 14, 2017. This item is in the category "Automotive\Parts & Accessories\Car & Truck Parts\Engines & Components\Timing Components". The seller is "partsmonkeyca" and is located in London, Ontario.